Normally when someone peaks into the window of another persons home, that's creepy enough. Can you imagine spying through someone's window, only to discover someone being murdered? It's a peeping tom's nightmare. If anybody can take an already creepy concept and turn that volume up to 11, it's Alfred Hitchcock. This was one of those movies I used to watching as a kid. Seeing it as an adult now just makes me appreciate it more. 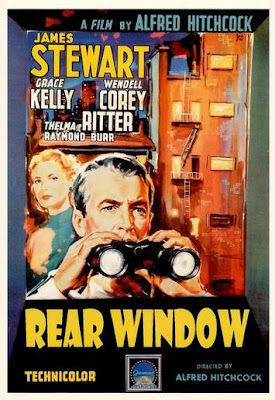 I love REAR WINDOW, and I'm sure most of you reading this list do to. It's such a great movie. Both its story and visual perspective are dictated by its protagonist's imprisonment in his apartment, convalescing in a wheelchair, from which both he and the audience observe the lives of his neighbors in a cheerfully voyeuristic fashion. L.B. Jeffries (James Stewart) is an adventure-loving professional photographer sidelined by an accident while on assignment. When the invalid wife of the salesman Lars Thorwald vanishes, Jeff believes the man might have killed his wife. He tells his concerns to Lisa and to his nurse Stella and the women agree with his observations, but his friend Detective Thomas J. Doyle finds reasonable explanation for each remark. However, Lisa decides to go further in her investigation, getting closer to the suspect. One could argue that the murder plot is the MacGuffin--a mere pretext--in a film that's more interested in the implications of Jeff's sentinel perspective. When Jeff peaks out into other peoples homes, he gives the residents weird names to remember them by. Later we learn more about the lives of the other neighbors. Jeff's evident fear of intimacy and commitment with Lisa provides the other vital thread to the story. As with most of these mysteries I can't really explain too much without giving away the entire movie, so I'll just let it rest for now. REAR WINDOW has been called one of Alfred Hitchock's best. And as you can see we completely agree (it's on our list!). It received four Academy Award nominations and was added to the United States National Film Registry in '97. REAR WINDOW has been re-told, parodied and referenced many times. DISTURBIA (2007) was practically a modern retelling of the story. This goes to show you that an old idea never goes out of style! As with more of Hitchcock's classics, Universal has re-released REAR WINDOW in an awesome Legacy Special Edition set. Chalk full bonus features that will make you love and appreciate the movie even more. 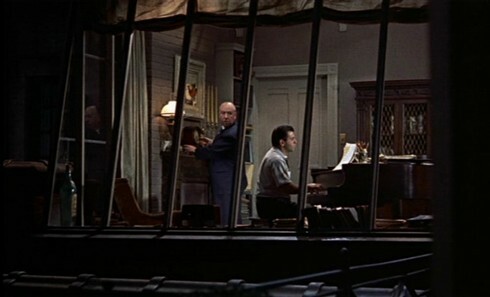 CAMEO NOTE: About 25 minutes into the film Hitchcock can be seen winding the clock in the songwriter's apartment.